​Our workshops and events help women prepare and manage the transitions of working motherhood, and design a career and life that works for them and their families. 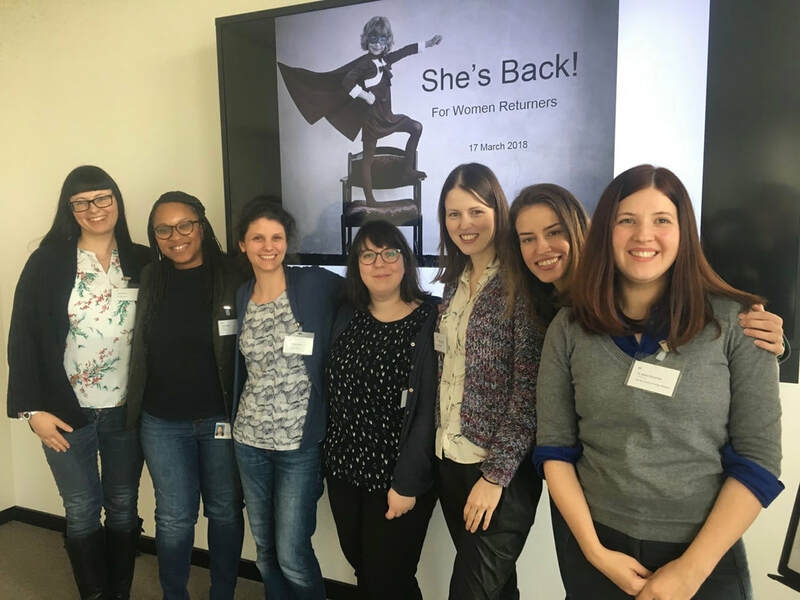 ​We know that many women don’t have access to the kind of support we provide our clients’ maternity returners and with this in mind, part of our ‘giving back’ this year is hosting a series of She's Back! workshops that are absolutely free to the individuals taking part. We are immensely grateful to EY for enabling this to happen, and proud to be sponsored by a recognised leader when it comes to recruiting, retaining, developing and promoting female talent. Bringing together women from a range of organisations - from small and medium businesses to multi-national corporations - our She’s Back! community workshops give you the information and resources you need to plan and prepare for a smooth and confident transition back to work, and set yourself up to succeed - both at work and at home. Perspective, insights and context to managing your transition back to work. Strategies to address common challenges such as guilt, logistics and ‘balancing’ work and family, as well as confidence, your personal brand and raising your profile. Peer discussions with other women at a similar stage, and facing similar challenges. Time and space to stop and reflect through structured exercises, including a return-to-work action plan. The workshops are tailored for professional women who are returning to work or have recently returned to work after maternity leave. Most of our current work at Work Happy Mums is with mid-level to senior professional women, across a range of industries, and we have those women in mind when thinking about the style and substance of the sessions. If you are interested in joining our next workshop (date tbc), please fill out this short form to tell us a little more about yourself. We'll be in touch as soon as the details have been confirmed. ​Exclusively for mums, our 6-module online Career Relaunch Coaching Circle starting on 23 May is designed to help you clarify your goals, build your confidence, develop your job search skills, and set off on a new career journey. ​And the best part? Access to an intimate, supportive group of like-minded mums in a similar stage of life and career. Through Melanie's coaching and the support and encouragement of your fellow group members, you will gain the confidence and forward momentum to set your return to work goals - and achieve them! ​​The M | Power Mastermind Club meets on the first Monday of each month to support and inspire mums in business, whether you are thinking about starting a business, at the early set-up stage, or already have a business up and running and are wanting to take it to the next level. At each session, members of the group get the chance to check-in on their progress towards their business goals and commit to the action steps they're going to take to reach them. ​You'll be surrounded by other women on this shared journey who can support your dreams and vision, bolster you when obstacles arise, share the ups and downs and celebrate your successes with you. The group is made up of no more than six women - so you can really connect and get down to business.